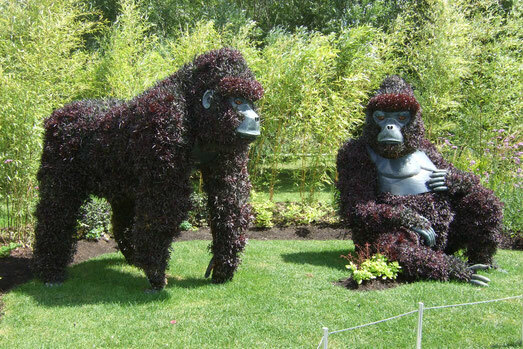 Mosaicultures Internationales: Gorillas at Risk! Description: Largest of the living primates; males up to 6 feet tall and 400 pounds, females up to 5 feet and 200 pounds. Greater weights occur in captivity. Status: The gorilla is listed as endangered, and commercial trade of this species is prohibited by international law. Principal causes of population decline are habitat destruction and hunting. Poachers prize adult males and disrupt troops by killing leaders. Habitat: tropical secondary forest: the herbs, shrubs and vines that make up its diet grow best where the open canopy allows plenty of light to reach the forest floor. Niche: Herbivorous: feeds mainly on leaves and stems but never strips one site completely. Zoo animals are also fed milk as a source of protein and B vitamins. Western subspecies takes a higher proportion of fruit, a more limited resource, which appears to limit troop size to 5-10. Primary predator in historical times is man. How are gorillas like people? How are they different? What might a gorilla eat that you could eat too? Name some other primates. How are they similar to or different from gorillas? How could you help protect gorillas and their habitat? What adaptations does a gorilla have that make it uniquely suited for its environment? 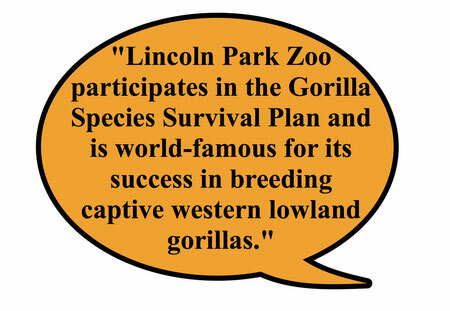 If you had to design a zoo exhibit for a gorilla troop, what would you include? What would you leave out? Clearly gorilla biology would be an interesting topic in a science class, but you could also incorporate information on gorillas into a class on politics, geography or reading. There are countless books and web sites about gorillas, as their similarity to humans makes them a fascinating topic. I would suggest you seek books by and about Dian Fossey, information on the Mountain Gorilla Veterinary Project and lighthearted books like Good Night, Gorilla for younger students. The content material is definitely written. This blog is usually sharing useful records. Hold sharing more posts. The submit is without a doubt superb. It has many helpful information that is written in a simple and meaningful way. Thank you for sharing this article.